Of course this is not the weather we hope for but there are some solutions to help control the outcome of your bridal hair and makeup. Since we can’t control the weather, let’s see what we can control instead. Shall we? Breathe! Trust your stylist. They have the experience, and know your hair. Listen to them. They will try everything in their power to make you look like the best version of yourself regardless of the weather. 2. Wear your hair up. Wearing your hair up is always a good option if it is rainy, or humid outside. An updo doesn’t mean it has to be slicked back with hairspray. It can still be loose, and romantic. Having your hair up helps the stylist at least have some control over your hair. This ensures the curls won’t fall out, and really helps us control the frizz from mother nature’s worst humidity. 3. Clear umbrellas! Buy enough ahead of time for you and your bridesmaids. Even if it doesn’t end up raining it is always nice to have a backup plan. Photographers love umbrellas, and it gives you the option to still have your pictures outdoors. Check out pinterest, the pictures are stunning. 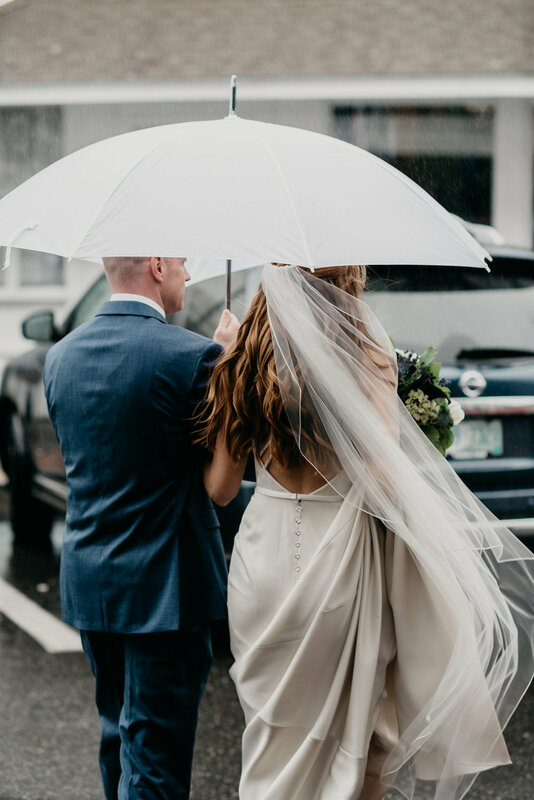 Keep in mind the umbrellas will also keep you and your bridesmaids hair and makeup dry if you have to go outside for any reason during the wedding or beforehand. 4. Setting spray. Make sure your makeup artist uses a setting spray for your makeup. Through humidity, sweat, tears, and very light rain, this will be your savior. Always dab your face, do not wipe! Unfortunately setting spray will not save you from a downpour, so as i said above please use an umbrella. 5. Stay inside. Let your bridesmaids, family, and friends do the work the day of the wedding. If it is raining or humid, you should try and stay indoors as much as possible until it is time to head out for pictures, or your ceremony. Staying inside, will help preserve your hair and makeup for longer. No one wants to be sweaty, sticky, or wet, before they have even seen their future spouse. Let people help you. Sit back and relax, this is your day. 6. Rain is goodluck. Look at the brightside. No matter if it is raining cats and dogs, or a perfectly sunny day, you are marrying the love of your life. This is going to be the best day! Embrace it, cherish every moment. You will be stunning. My stunning bride Danica(above), had to deal with torrential cold downpours for her labor day weekend wedding. She handled it as though it was a perfect sunny day. Surrounded by her family and her best friends, getting ready was full of laughter, and excitement. Not one of the girls let the weather decide how they wanted their hair done. Danica wore her gorgeous strawberry blonde locks in loose curls, slightly pulled off her face. 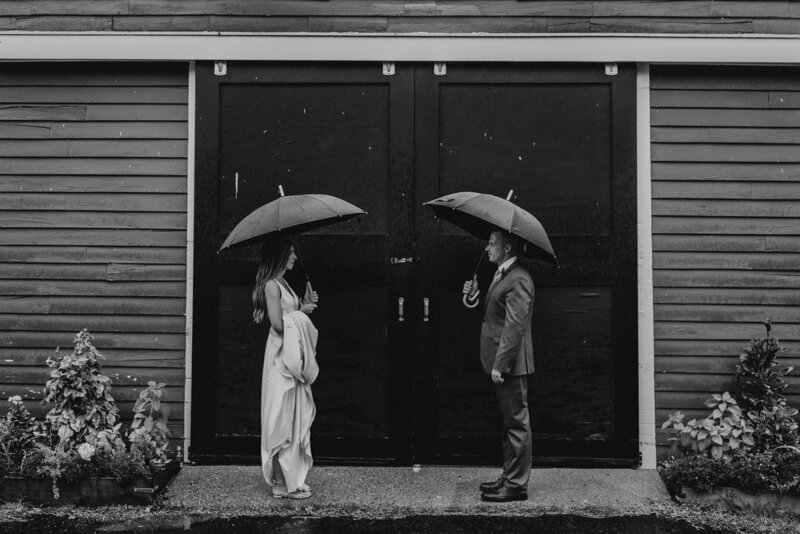 Donning her umbrella, and her new husband she embraced the rain and was the most beautiful bride.